Hanoi (VNA) - Around 84,000 people attended the opening ceremony of the 29th Southeast Asian (SEA) Games at Bukit Jalil national stadium in Kuala Lumpur, Malaysia on August 19. Around 14,000 security personnel were deployed to ensure safety for the ceremony, themed “Rising together”. The ceremony featured drum and traditional martial art performances and a procession of 320 flags of Malaysia which symbolised 32 million people in the country and then 11 flags of 11 participating Southeast Asian nations. Malaysia spent 105 million USD to host the event, six times higher than the amount estimated in 2013. This is is the sixth time Malaysia has hosted the regional games. The Vietnamese delegation has 681 members, headed by Deputy Director of the General Department of Sports and Physical Training Tran Duc Phan. 472 Vietnamese athletes will compete in 32 out of 38 sports at the event. 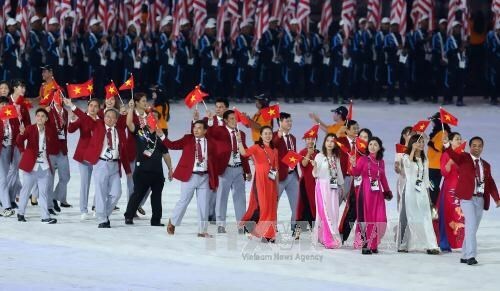 The Vietnamese athletes will strive to pocket 49-59 gold medals to rank in the top group at the biennial games.